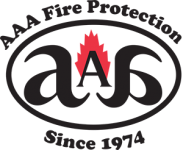 AAA Fire Protection Services is a specialty company that offers small, medium and large businesses an easy way to meet local, state and federal compliance for fire protection and fire suppression. We bring over 40 years of experience to the table and we work with you as though we are your partner. What that means is that our experts evaluate your business based on industry requirements for fire protection and fire suppression. For example, we install, maintain and repair Ansul fire systems and if you are a specialty industry such as automotive paint shops we would install paint booth fire systems to meet the automobile industry's requirements. In addition, our emergency light installation is also comprehensive. We don't just install emergency lights. We offer emergency light service, which means regular emergency light testing and if a problem is found, we offer emergency light repair services. We do all of this on our calendar, meaning that we track the dates when things are due and we make sure that your business is always in compliance. AAA Fire Protection Services is a family owned business that provides industry experts across all industries within the San Francisco Bay Area, including Newark, the East Bay, South Bay and the North Bay. We help companies just like yours reduce the risk of fire and increased safety in case there is a fire.